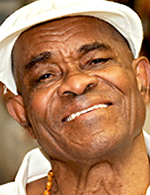 Mestre João Grande (João Oliveira dos Santos ) was born on Jan. 15, 1933 in the tiny village of Itagi in the south of the state of Bahia. At the age of 10 he saw “corta capim” for the first time. This is a movement performed by crouching down, extending one leg in front and swinging it around in a circle, hopping over it with the other leg. Fascinated, he asked what it was called and was told that it was “the Dance of the Nagos”— a dance of the African descendants in the city of Salvador. The Yoruba of Southwest Nigeria had a major cultural influence in Salvador, which was considerd the Black Rome of Brazil. But the dance was actually of Central African origin— it was Capoeira. João didn’t learn the correct name of the movement until many years later, but it changed his life forever. At the age of ten he left home in search of “the Dance of the Nagos”. Mestre João Grande saw Capoeira for the first time in a place with the poetic name “Roça do Lobo” (Clearing of the Wolf). It wasn’t an average street roda he saw that day, but a meeting of the important personalities of Capoeira such as Menino Gordo, João Pequeno, who was there with his first Capoeira teacher, Mestre Barbosa. At the age of twenty, João was beginning capoeira relatively late in life. He went on to study with others teaching at Pastinha’s academy, Cobrinha Verde included, but his primary influence was always, and continues to be, Pastinha.